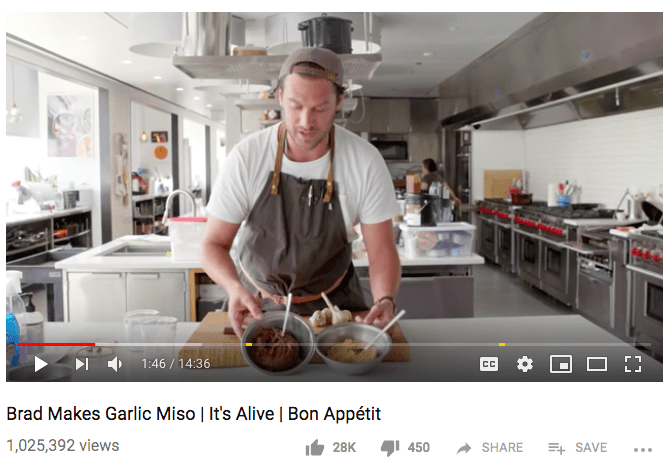 We just LOVE this super awesome "Brad Makes Garlic Miso" video from by Bon Appétit Test Kitchen Manager, Brad Leone! What we love the most is that Brad is using our American-made, organic Miso Master Miso to ferment the garlic into umami perfection. Brad completes the video by preparing a "delicious garlic-infused miso soup" ... YUM! 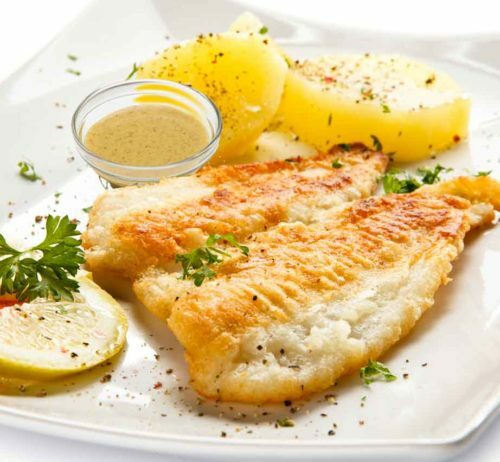 We hope that you will enjoy testing out this "Lemon-Mustard Broiled Flounder" recipe which is our Recipe of the Month for September. This simple to prepare, flavor-filled fish dish is seasoned with lemon, mustard and our #American-made, #organic, Miso Master Mellow White Miso. Click here for a printable recipe that you can prepare and enjoy with family and friends. These tasty, homemade "Soba Nori Rolls" are filled with our Organic Planet Organic Soba Noodles (in place of sushi rice) and rolled in our Emerald Cove Organic Toasted Sushi Nori. Let your creativity go and add your favorite fillings. Be sure to invite family and friends over to roll own because everyone loves nori rolls! Our Emerald Cove Organic Toasted Sushi Nori is ready-to-roll right out of the package! Homemade sushi nori rolls have never been easier to prepare. And we can't forget to mention how absolutely delicious these tasty sheets of nori are. Some of our fans eat them right out of the package as a snack. Use them to make your favorite rice, quinoa, or soba nori rolls. Use your imagination to create your own supreme sushi rolls. Impress your family and friends by sharing your homemade sushi nori rolls at family gatherings and potlucks. Have fun making your very own sushi nori rolls with Emerald Cove Organic Toasted Sushi Nori! Available in 10 and 50 sheet resealable packages. 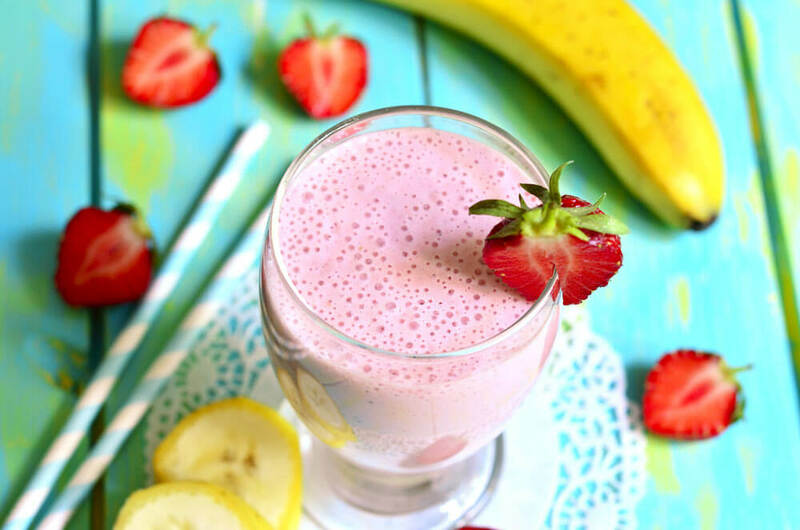 What could be more cooling on a warm spring day than a refreshing smoothie? We like to add a twist of our Haiku Organic Japanese Sencha Green Tea to our smoothies to enjoy all the goodness of green tea and as an late morning or early afternoon pick-up. This recipe calls for frozen strawberries (be sure to use organic!) and frozen bananas, however you can get creative and try your favorite frozen fruits. 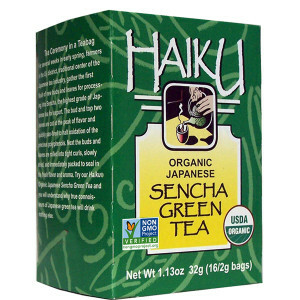 Our Haiku Organic Japanese Sencha Green Tea is made from the finest new spring buds and leaves of the tea bush. Each of our teabags are filled with two full grams of delicious, 100% Japanese Organic Sencha Tea. 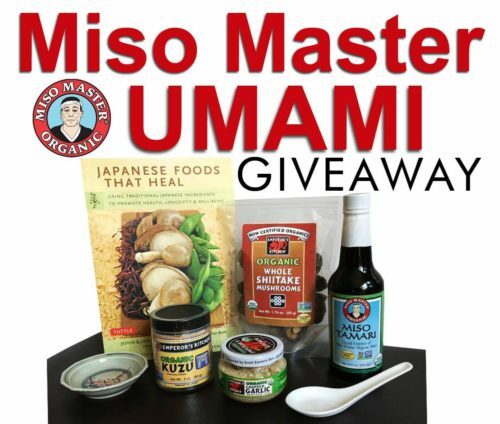 Be sure to enter our spring 2018 Miso Master Umami Giveaway for a chance to win some awesome goodies, including our Miso Master Organic Miso Tamari, Emperor's Kitchen Organic Whole Shiitake Mushrooms, Emperor's Kitchen Organic Chopped Garlic, Emperor's Kitchen Organic Kuzu and a copy of Japanese Foods That Heal by Jan and John Belleme to make some healthy, "umami" dishes at home! We will choose one lucky winner on June 21, 2018. Hurry and enter TODAY and share this giveaway with your family and friends! Be sure to check out this awesome website, Umami Information Center to learn all about the fifth taste of "umami" which was discovered by Japanese. Spring has arrived at last here in the mountains of Western North Carolina. Here at Great Eastern Sun, we enjoy organic gardening, cooking with the seasons and shopping at our local tailgate markets. 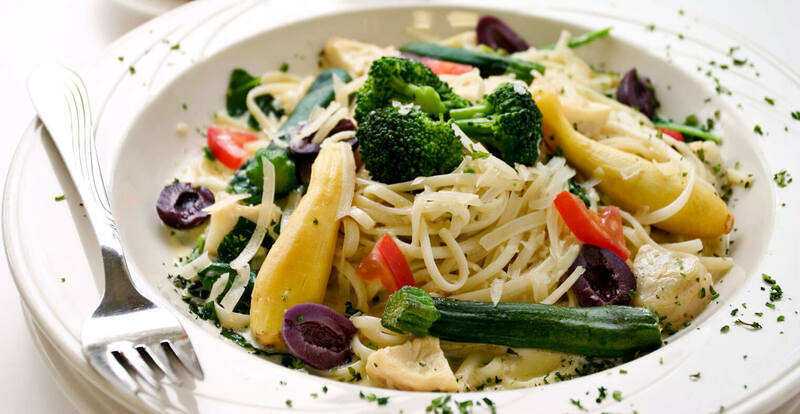 As the weather warms, we switch out warming vegetable soups with more pasta and veggie dishes such as this "Udon Salad" our Recipe of the Month for April made with our tasty Organic Planet Traditional Whole Wheat Udon noodles. This tasty Udon Salad is tossed with a delicious dressing made with our handcrafted, Miso Master Organic Mellow White Miso. Enjoy this delicious Sweet and Sour Sauce over your favorite stir-fry, Asian-style pasta or rice dishes! 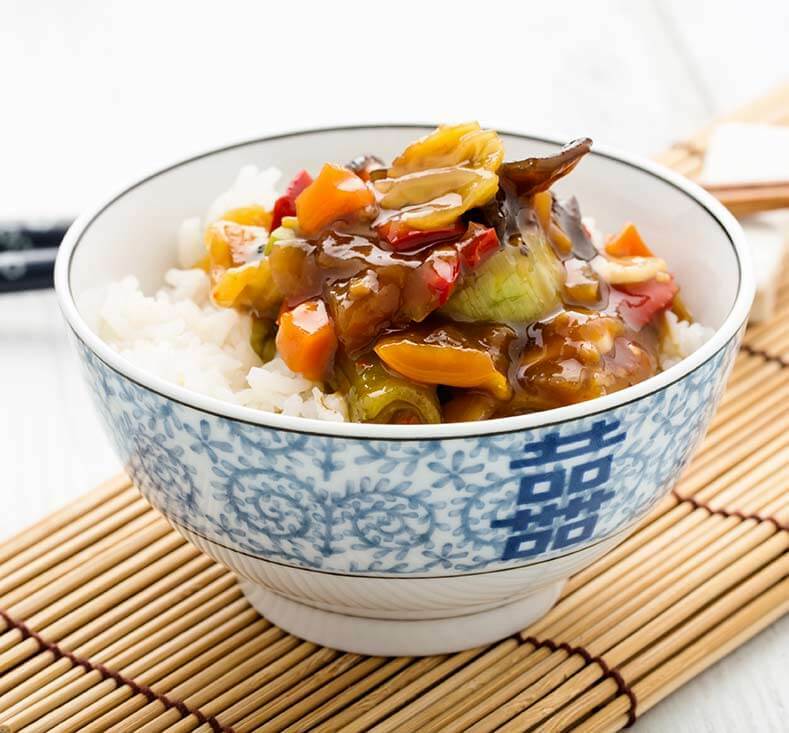 This tasty classic sauce features two of our Emperor’s Kitchen customer favorites, our Emperor’s Kitchen Organic Kuzu, and Emperor’s Kitchen Organic Pureed Ginger. Our Sweet Cloud Organic Brown Rice Syrup adds just the right amount of sweetness. 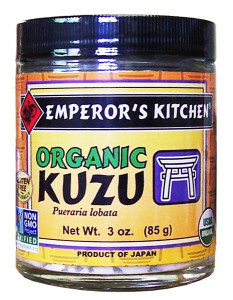 Kuzu has been used in East Asia as an important medicine in traditional pharmacopeia for more than 2,000 years. The starch that makes kuzu such an outstanding jelling and thickening agent in cooking is partly responsible for its medicinal action. Some of kuzu’s complex starch molecules enter the intestines and relieve the discomfort caused by overacidity, bacterial infection, and, in the case of diarrhea, excess water. In many instances of abdominal aches and intestinal irritation, a cup of simple kuzu cream (kuzu with umeboshi paste, shoyu, and fresh ginger juice) brings quick relief, particularly with children, who often do not like the taste of over-the-counter medications. Kuzu cream is also very useful against colds, stomach cramps, diarrhea, neutralizing stomach acidity, and relaxing tight muscles. Kuzu also contains a very high concentration of flavonoids, powerful natural antioxidants, which contribute to this plant’s strong medicinal effect on digestive and circulatory ailments. Flavonoids also inhibit the contraction of smooth muscle tissue, thereby increasing blood flow and relieving cramping in the intestines. The medicinal effects of kuzu’s flavonoids were proven during numerous clinical studies in China in the 1970’s. These published studies showed that crude kuzu root preparations or their extracted flavonoids, given as injections or taken orally, Researchers also report that flavonoids lower cholesterol levels, reduce the risk of forming blood clots, protect the heart against cardiovascular disease, and protect the brain by dilating cerebral microvessels to increase blood flow. reduce high blood pressure, regulate blood sugar, and relieve chronic migraine headaches.
" 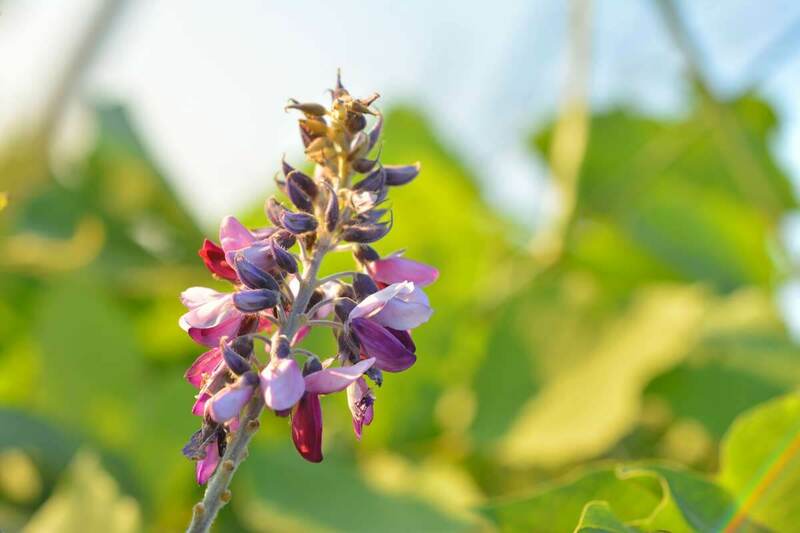 In 2009, researchers found that compounds called isoflavones in the kudzu root could help control diabetes by helping to regulate blood pressure, cholesterol, and glucose. Folk herbalists have long claimed kudzu as a remedy for alcoholism and hangovers and scientists at the University of North Carolina at Chapel Hill have investigated the kudzu compound puerarin as a potential treatment for alcohol problems." Sweet Valentine Treat with Miso! Many miso fans might be surprised to learn that miso is a popular ingredient in desserts and tasty treats like our Recipe of the Month, Miso Chocolate Truffles! Miso adds that perfect balancing touch to tone the sweetness of these delectable little gems. In Melissa Clark's interview "From Matcha to Miso, 7 Japanese Ingredients You Can Add to Desserts", Kyotofu author, Nicole Bermensolo shares just how to incorporate this unique "umami" ingredient to desserts. In this interview, Melissa asks Nicole, "I've had miso soup, and it's a very savory flavor. How do you use that in a dessert?" and Nicole shared, "Miso is great. It's one of my favorite ingredients of all-time. The reason that I like it so much is because it's salty and it can be used as a salt replacer. But it has all kinds of interesting flavor dimensions to it. It has the umami, it has the butteriness, a little bit of nuttiness. When you add it to something that goes well with something kind of salty and savory like chocolate or caramel, miso just adds this whole other dimension that you don't get with just straight salt." So, yes! Miso can be used in desserts and you can try our Miso Chocolate Truffles ~ Recipe of the Month to test using our, low-sodium Miso Master Organic Sweet White Miso. 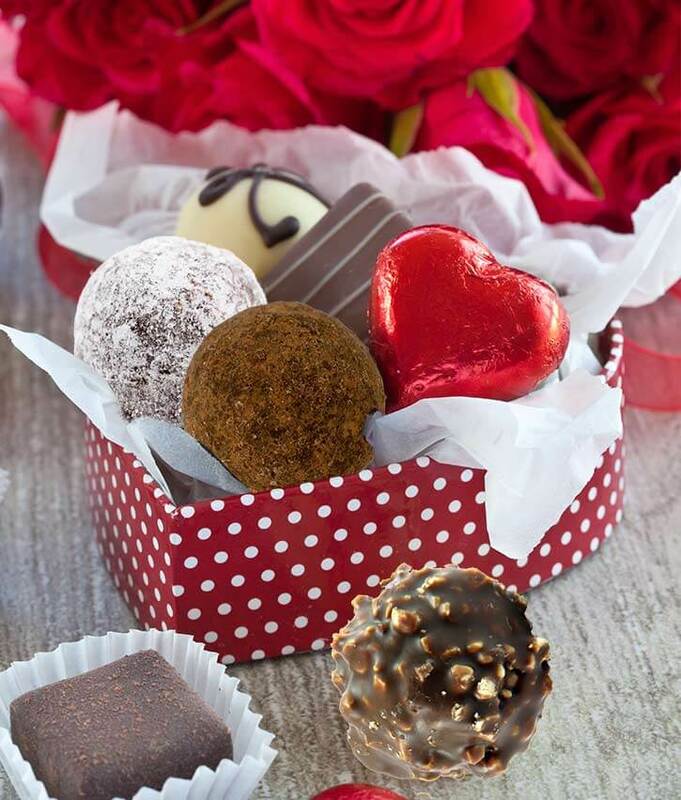 Hope that you enjoy a sweet Valentine's Day! 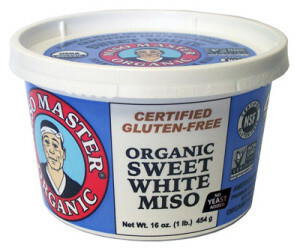 WIN FREE MISO MASTER MISO! 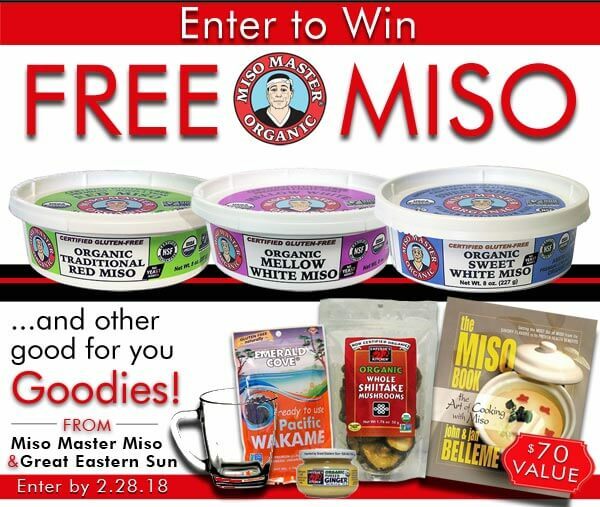 You could be the lucky winner of some of our popular Miso Master Organic Miso and other awesome Great Eastern Sun products and goodies in our Marvelous Miso Master Giveaway for February! We love giveaways! It's fun to spotlight some of our awesome organic and natural brands and products that we're so proud of, especially our American-made, organic Miso Master Miso. If you would like to read our Miso Master story, check out our new "Miso Master Miso Heritage" story on Facebook. The winner will also receive a copy of The Miso Cookbook by John & Jan Belleme and an American-made Glass Miso Mug! It's easy to enter and share this marvelous giveaway and share with your family and friends. Click the link below for more details and to enter by February 28, 2018. Good Luck! It's always super exciting to see other brands using some of our organic products as ingredients in their products! 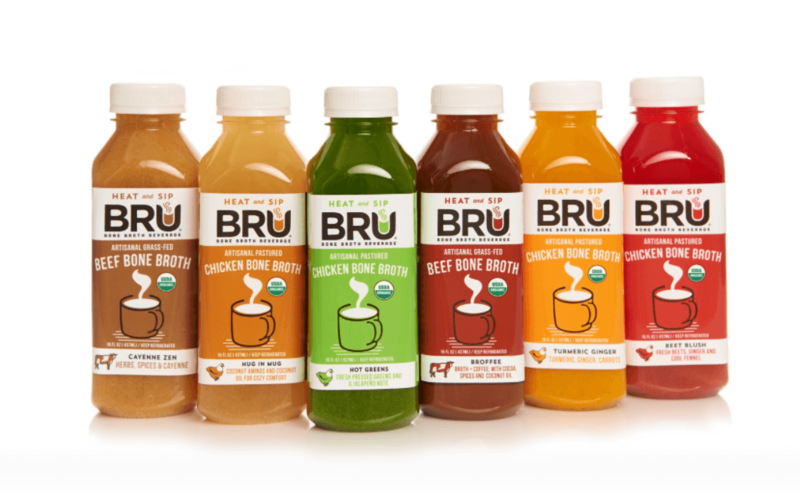 The creative makers of BRU Broth (the 1st Organic Cold Pressed Bone Broth Beverage) have added the goodness of fresh pressed superfoods to their tasty organic bone broths and including our organic, soy-free, Miso Master Chickpea Miso​! to three of their six tasty BRU broths. including Miso Master American Made Miso, Emerald Cove Sea Vegetables, Emperor's Kitchen and Sushi Sonic Asian condiments, Mother India Organics traditional Indian meals, Organic Planet Organic Noodles, Haiku Organic Japanese and One World Black Teas. 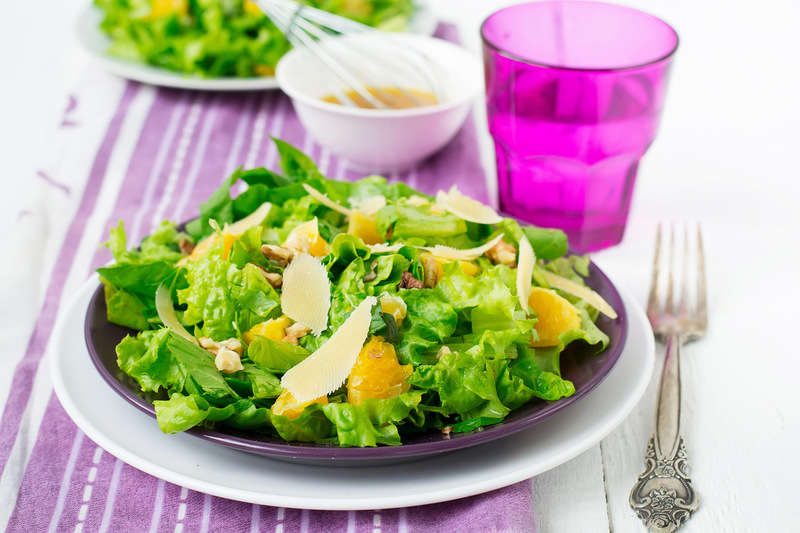 We also want to be a source for you to learn more about the benefits and how to prepare all the natural and organic foods and ingredients that we offer through our Great Eastern Sun's Healthy Table blog. We hope that you enjoy in good health! Autumn has arrived here in the mountains of Western North Carolina with all its beauty of the changing leaves, cool air and pumpkins. 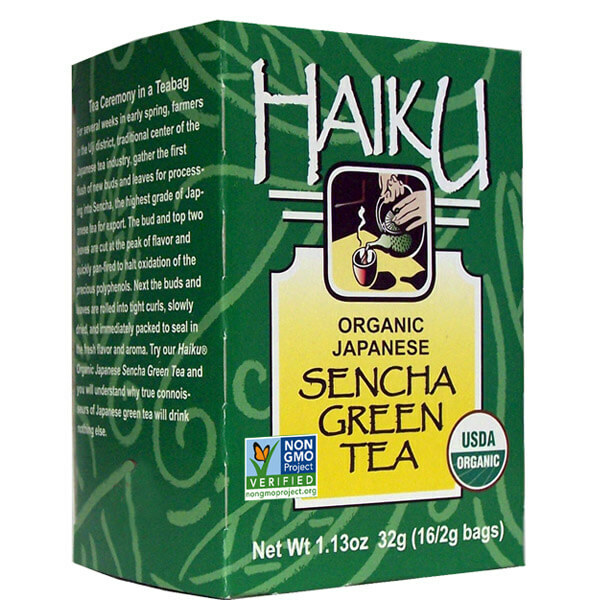 Haiku Organic Japanese Sencha Green Teas are available at your local organic food market or purchase direct in our Great Eastern Sun Online Shop. Hot Sencha Tea from Teabags: Bring cold water to a full boil. Immediately remove from heat and let sit for a minute. Pour over the tea, using one cup of water per teabag. Allow to steep for no more than 1-2 minutes or tea may become bitter. Hot Sencha from Loose Tea: Bring cold water to a full boil. Pour 1 cup of boiled water over 1 teaspoon of Haiku Green Sencha tea leaves and steep for 1-2 minutes, strain leaves and enjoy. Iced Sencha Tea from Teabags: Bring 4 cups water to a boil, and pour over 4 teabags. Allow to steep for 2 minutes. Remove teabags and sweeten, if desired. Stir well, chill for at least ½ hour, pour into serving pitcher, add ice and cold water to make 2 quarts, and serve. To brew, bring 7 cups water to a boil, remove from heat and add 4 teabags. Cover steep for 2 to 3 minutes. Remove teabags and chill for at least 1/2 hour. 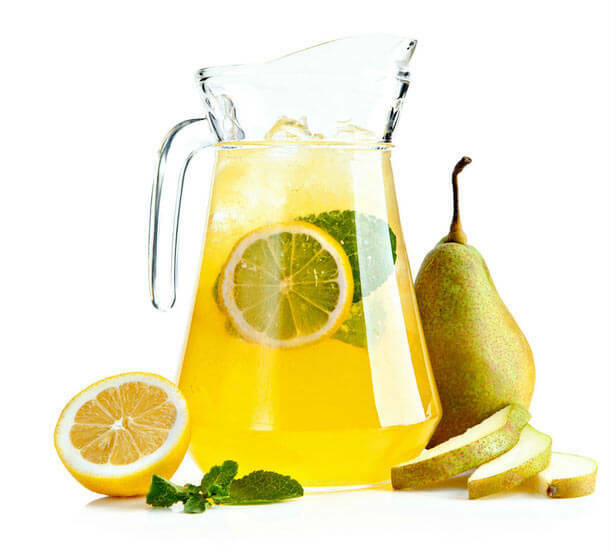 Then pour into a serving pitcher, add 1 cup organic pear juice, stir well, and serve. MAKES 1/2 GALLON.